This item is an antique piece of linen with lovely pin tucks & lace that I have hand dyed. Some are plain dyes while others are 2 tones making different shades. After dyeing I sew these into a delightful little dress. I hand embroider dimensional flowers flowing down the bodice or skirt depending on the fabric, fold of skirt etc.. with french knots & dimensional flowers. Each one is OOAK One of a Kind and totally individual and unique tiny piece of artwork. Each dye lot will be completely different and embroideries are as varied .. happy to take custom orders. 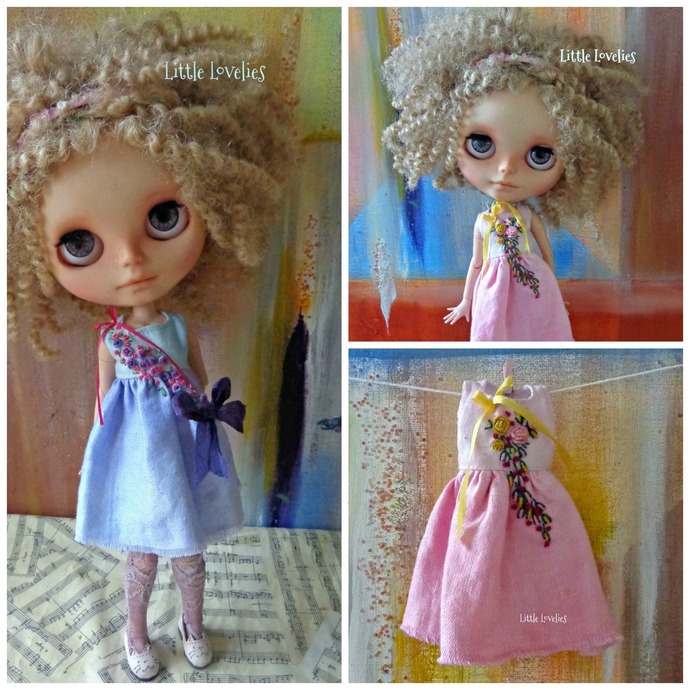 This garment is made for Blythe - Takara and Neemo bodies along with Pullip, Barbie, pPinky & dolls of similar sizes. Each is a precious one of a kind piece of artwork. I am not a perfect sewist but the garments are made with care and attention to detail and finishing. This is made with care and attention to detail and finish and will last Accessories not for sale. There will be more in different colours.